Happy Monday! 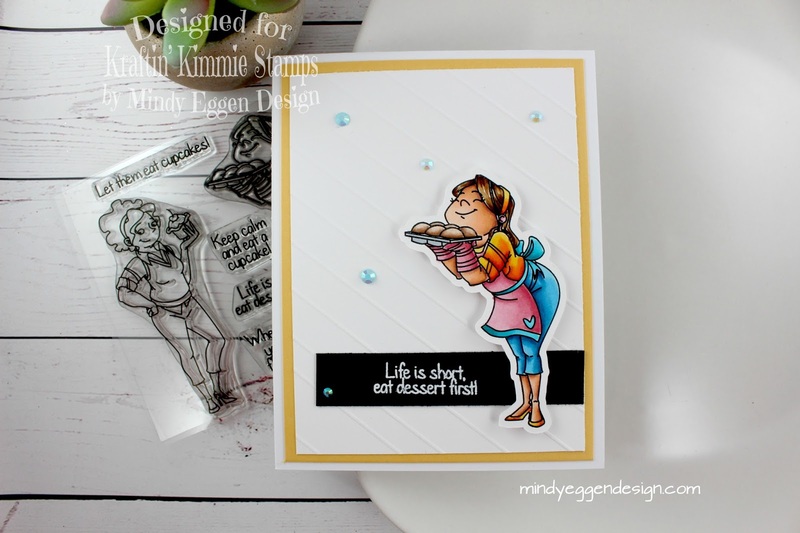 I have some fun things to share today including a coloring video featuring Kraftin Kimmie Stamps! I’ll be coloring up an image from Let Them Eat Cupcakes stamp set. Seriously how fun does that stamp set sound? 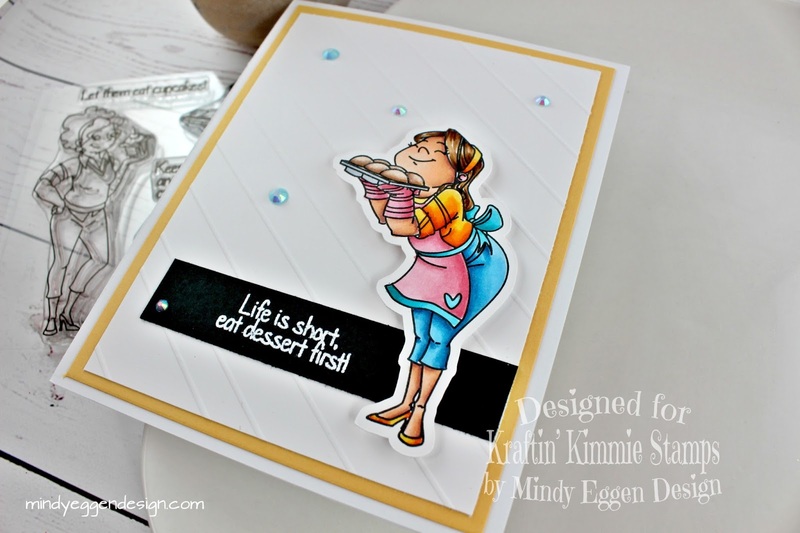 You can pick up your own stamp set over at Kraftin Kimmie Stamps. For my card today, I stamped my image onto Neenah white cardstock with copic friendly black ink. Then colored with copic markers. I cut out my image with my Scan n Cut machine leaving a little bit of a white border. Next, I used a piece of neenah white cardstock cut down to 4 1/4″ x 5 1/2″ and lined it up in my Scor-pal. I put one corner at the top, tiled crooked and starting scoring every 1/2″ across the card. This will give a fun embossed look on the other side. I’m using an A2 size cardbase that I will layer with a piece of Lawn Fawn Sunflower cut down to 4″ x 5 1/4″ . Then I will trim down my embossed panel to 3 3/4″ x 5″ and layer onto the yellow. 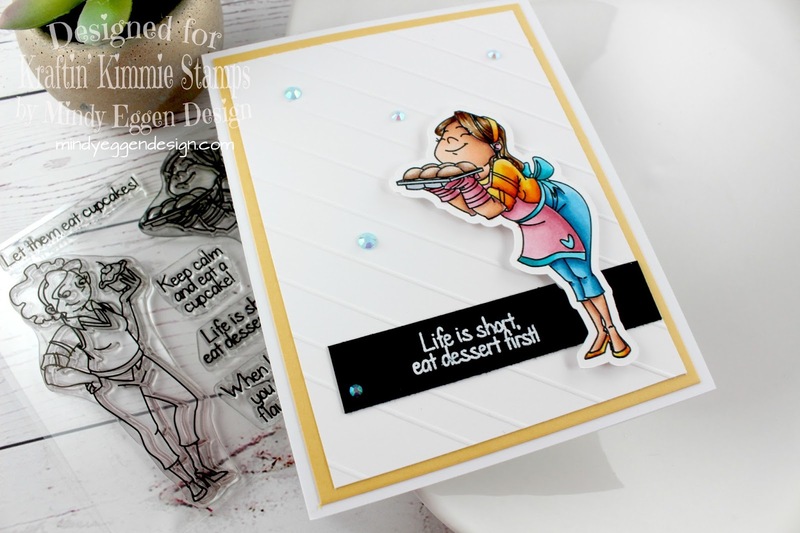 I will take a sentiment from the Let Them Eat Cupcakes stamp set and heat emboss onto a black piece of cardstock. To finish the card off I’m going to add a few jewels around the card front using some Nuvo Deluxe Adhesive and my jewel picker. I also take my Nuvo shimmer pen and add a little shimmer to the muffins/buns. You can view the video down below or HERE on my channel.